Welcome to your weekly fix of MLS attendance. A couple of notes: Why did MLS go ahead with its schedule (2nd week!) knowing full well that there would be important international matches to be played? A good number of national-teamers were out and not just US players but all of Concacaf, Conmebol, UEFA, CAF and AFC! Why not start a week early, do a mid-week run of games and then a week off for international play? So there you have it. That's why attendance this week was less than stellar. Not even strong markets like DC and Columbus fared well. DCU hasn't created much buzz this off-season so a starting crowd of 15000+ on an international fixture is not bad. Columbus could have done better than 14686 against bitter rivals Toronto but at least it was a respectable crowd. What's not respectable? Dallas. Less than 7000 souls were present for another sub par performance from the Hoops. What does Hyndman need to do to get the team rolling? I'm not even worried about the crowds here. Seattle saves all. An over-MLS-limit crowd was present to witness Fredy Montero light things up against title contenders Real Salt Lake. Next week comes Toronto and RSL's season debut. Numbers should be coming up. 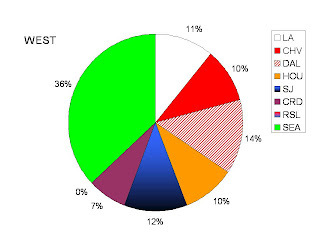 In the meantime, have a look at the pie graphs below. one for this season so far (Sounders green all over). Ecuador 1 - Brazil 1. Quito. From a historical perspective I feel it's only logical that the game would end this way. Then again, things have not been at all logical in South America for the past 10 years. Since then, Ecuador's rebellion against a sad, unaccomplished soccer team has changed into a world class squad with players in multiple European leagues. But normalcy always rebounds into action. Here we have a string of bad results starting with Copa America 2007, where Luis Fernando Suarez's schemes became ineffective and the Ecuador Federation (FEF) decided not to act. Unlikely as it may have seemed, Venezuela, the infinite Cinderella in South America took a 1-0 victory in Quito on opening day of the 2010 qualifiers. A sad start for an immobile squad, stagnant in depth and perception. And I'm not bashing the players altogether. 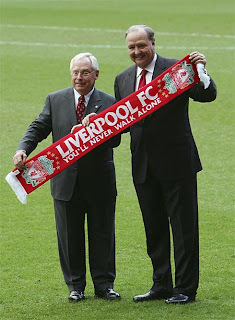 The core remains but their focus has been refined by Suarez's successor--Vizuete. Back to the start of qualifying... After the Venezuela debacle, Ecuador went to face two of CONMEBOL's toughest teams on the road: Brazil and Paraguay. Both were terrible losses with a -9 goal differential. Vizuete did some magic after Suarez resigned following Paraguay's 5-1 thrashing of Ecuador in November of 2007. Peru would fall to Ecuador 5-1 in Quito. An important, almost win in Buenos Aires would come early in the summer of 2008. Argentina was on the verge of losing at home to lowly Ecuador. Fate (referee) intervened, time was overallowed and Argentina would tie the game in injury time. To follow was a painful tie at home versus Colombia. That's 5 points in 6 games. Vizuete, however, would go undefeated in qualifying for six straight games including ties in Argentina and Uruguay. Home wins versus Bolivia and Chile added to his impressive run. 12 points and it was time for return matches in South America's marathonic qualifiers (all 10 teams play each other in home-away fashion). A revenge win away to Venezuela would help matters. This is where things went wrong for Vizuete. A string of injuries and suspensions left him with a depleted side against a Venezuelan team vying for its first entry into the World Cup. 3-1 in Puerto Ordaz was the score. Ecuador was left with 12 points and outside of qualification zone. A new year. A new(ish) team. Caicedo has been building up his resume in Manchester City, the back line has mostly returned to Ecuador (except for Hurtado in Colombia) and the midfield is in flux. Cristian Noboa from my birthplace, Guayaquil, summed up a great career year with Rubin Kazan of Moscow. He was called into the latest squad for the games at home versus Brazil and Paraguay. And he delivered. The latest game against Brazil should have gone to Ecuador. More chances, more shots, more determination, more fans. It was not to be. Even when it seemed like a 1-0 win was imminent, a cold splash of water came with Julio Baptista and a 0-1 score now glared from the scoreboard. But an important change in the squad, switching Joffre Guerron for Cristian Noboa paid off with a goal. A tie at this point in qualifiers is not a good sign, not even against Brazil. The ghost of the numbers game is now upon fans of the Ecuador national team. A familiar sight, albeit one we have not seen since France 98. With Paraguay, Argentina and Brazil all but locked it is now between Uruguay, Chile, Colombia and Ecuador for the 1.5 spots left. The half-spot will go against Concacaf's 4th placed team. At this point in the last two qualifying campaigns the team had 16 (2002) and 18 (2006). 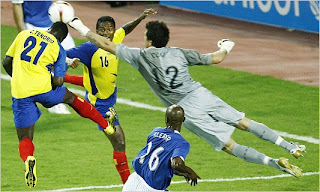 For the 2010 campaign, Ecuador has 13 points going into the next match. Next up, Paraguay in Quito. A must win. No Gooch (Onyewu), no Tim Howard in goal. I mentioned in my previous post that this indeed had the makes of a hard game for the US. It's hard to imagine an important team having a hard time against so-called "minnows," i.e. El Salvador. But such was the case. Potentially it was the noise from the boisterous fans, luck of the draw, good Salvadoran side, or bad football. Bradley's team didn't gel today. The offense was uninspired for a good portion of the game. But it didn't start out that way. Even in the depths of the Cuscatlan, the considerable might of the US national team weighed heavily on the hearts and minds of players and fans alike. El Salvador scores first, early and painfully. It was a freak play partially blamed on the noise and an alteration of the US backline (Califf for Onyewu, Guzan for Howard). Point is USA was losing to El Salvador for the first time in 16 years. Things went from bad to worse. Pearce was getting lost and Califf confused. Errant passes from Beasley, Kljestan, Bradley and Dempsey didn't help. Donovan and Ching were trying to get it done up front but they received little service from midfield. Indeed, Ching repeatedly found himself playing defense. A change was needed. Bradley Sr answered with a surprise shift from 4-2-1-1 to an interchangeable 3-4-3 with Beasley as the "enganche," the polyfunctional position he excels at. In comes Altidore for a quiet Pearce. Things didn't pay off automatically, however. El Salvador answered Bradley's change with a beautiful second goal right after the second substitution (Torres for Kljestan). Hejduk was outdone by an appreciably shorter Castillo that headed the ball beyond Guzan's reach. Howard was missing but I'm not sure he would have done much better against the two goals scored. The subs and change in scheme turned things around from the Americans. 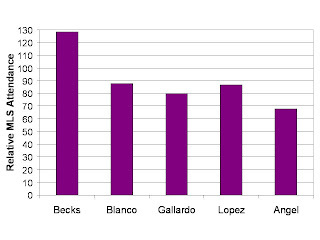 Torres was considerably more efficient than Kljestan in the midfield (again, playing time may be a factor here). The ball was solely in the American's possession. Soon it was Jozy taking care of business, using his size and strength to bring the score to 1-2. 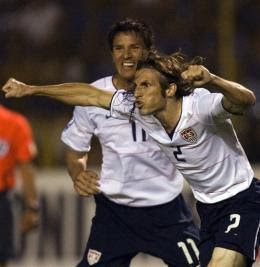 Hejduk, often clumsily beaten by Salvadorans in the first half, forcibly headed the tying goal 2 minutes to stoppage time. The man was inspired, but sometimes his aggressiveness with the ball and offensive play led to important attacks by the Cuscatlecos. In the end this was a lesson in humility. No one can be too big for history. Tonight, the considerable differences in quality between these two sides did not decide the outcome of the game. The US had to win back its style of play to come away with a tie that felt painfully as a loss. USA still leads the table with 4 points after Mexico beat Costa Rica and Honduras and Trinidad shared points. Next up is Trinidad in Nashville--a must win. El Salvador vs USA (Saturday ESPN2 and Telefutura for those few of you not watching NCAA). San Salvador, Estadio Cuscatlan. Tall order for the US team? Maybe. Playing away matches is always difficult. Here are the facts: the US has not lost to a Central American team since the 2006 qualifying round against Costa Rica. Preliminary Round 2 of world cup qualifying last year saw them victorious against Guatemala on Guatemalan soil (1-0, Bocanegra). The US last lost against Trinidad & Tobago (1-2) on Trinitarian soil with an undermanned, inexperienced national team. Game day 1 saw the US victorious over mighty Mexico by the score of 2-0 in Columbus, Ohio. Meanwhile, El Salvador rallied back to tie T&T on Salvadoran soil. Clearly there is a favorite here--USA. But in soccer as in any sport, there should be no favorites. El Salvador has competent players, a full stadium of ardent fans and considerable psychological advantage of the Estadio Cuscatlan. Who's to say the Salvadorans can't get a point or three here? Aside from favoritism and a slew of Europe-based players, the US has much less pressure compared to El Salvador. How/why is this possible? Media coverage. True, there are a lot of us fans and sports writers/commentators that are extremely interested in the team. However, how many media sources were present at team practice in Miami this week? 2 sources... Futbol de Primera and US soccer. How do I know this? The hosts of the morning show on XM Deportivo remarked this as an important factor for the US squad on this game and all games in general. Less public attention = less pressure. In contrast, there was a great deal of press prsent for the Mexican squad... and Argentina? 200 media sources covered their practice sessions. Remarkable? Hardly. Not with Maradona at the helm. I hold out hope for a positive result at El Salvador. I'm content with a tie but a win would be a giant step towards qualification. In qualifiers it is the results abroad that often dictate who advances to the World Cup. South Africa beckons and all teams involved have high stakes, no matter how much media coverage there is. Bradley is trying something different this time around. No Clark, Davies, Bornstein, Wynne, Rogers. It stands like this: GOALKEEPERS: Tim Howard, Brad Guzan, Marcus Hahnemann; DEFENDERS: Oguchi Onyewu, Carlos Bocanegra, Frankie Hejduk, Heath Pearce, Dan Califf, Jonathan Spector, Jay DeMerit; MIDFIELDERS: DaMarcus Beasley, Michael Bradley, Sacha Kljestan, Clint Dempsey, Jose Francisco Torres, Freddy Adu, Maurice Edu, Pablo Mastroeni; FORWARDS: Landon Donovan, Clint Dempsey, Brian Ching, Jozy Altidore, Eddie Johnson. Expect changes in roster between the two games. Howard is suspended for El Salvador (two yellows). Stay tuned for the rest of the world this weekend and mid week next week. UEFA, AFC, CAF, CONCACAF and CONMEBOL all have games in hand. France is on the verge of another major failure. England can solidify their chances. Same goes for Spain. Mexico (and Eriksson) badly needs a win. 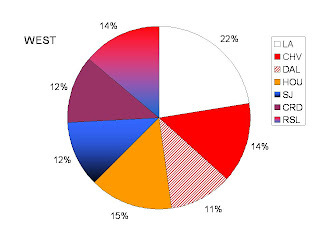 The Asian group 2 is highly competitive with the two Koreas and Saudis and Iranians all in the mix. There's more than one group of death in Africa (Cameroon vs Togo; Nigeria and Tunisia). Ecuador has two major games versus Brazil and Paraguay and I'm not too confident with the team this time around. Maradona (Argentina) can potentially breeze through Venezuela and Bolivia but upsets are not impossible. Indeed, lots of action. Welcome back to another edition of MLS. It is now season 14 and things are looking up (and in some instances looking down). Through the Beckham saga we have acquired new meaning abroad and domestically. The league is now 15-member strong with the addition of Seattle as an expansion team. And what an expansion team it is! A (probable European-bound) Freddy Montero opened up his account in MLS with two goals in a 3-0 win for the Pacific Northwest team on Thursday night of last week. Present was a sellout crowd of 32000+. Added to Seattle's success is the addition of two more west coast teams--Vancouver and Portland. Both were USL teams (Whitecaps and Timbers respectively) so a form of "promotion" seems to have occurred here. Indeed, as remarked by ESPN Soccernet's Ives Galarcep, the Pacific Northwest offers a sizable contingent of true soccer fans dying to have a professional team to call their own. Leave it to Drew Carey (Seattle) and Steve Nash (Vancouver) to add a little flair to ownership plus a great deal of enthusiasm. Last I read Vancouver had already sold 5000 season seats for their debut in 2011. Waiting for their debut is also next-year's Philadelphia. But not all is bright in MLS land. An expected, sub-par Beckham-less crowd of 18000 came to see the Galaxians face DCU in their home opener at the Home Depot Center. That's a small crowd compared to its capacity of 27000 (frequently filled last season with Goldenballs in the team). Dallas somehow managed to get in almost 16000 fans (probably there to see Blanco). They could use a DP injection, as would Houston. The two-time MLS Cup champions also opened to a reasonable crowd, even with Columbus (reigning champ) and Barros-Schelotto on the pitch. I hear, however, that the men in orange may be close to signing a major Mexican international. That would be a good start. Disappointing, in soccer terms, were teams like New York (2008 runner's up), Dallas, San Jose and KC. I'm also sad to hear comments from abroad about the state of our league. Hopefully time will change this. In terms of positives, it's very interesting to see Toronto play so well. They have a very deep squad with the likes of DeRosario, Guevara, Ricketts, Dichio, Wynne and Frei. They may be even scarier if management is able to secure a designated player. As always, I'll let the stats do the talk for me. Throughout the season I hope to have up-to-date attendance analysis graphics on the right column. I welcome feedback. A recent link between to Spanish Liga Adelante (second division) side Levante has Altidore's chances looking brighter. True, when he played for Villareal he looked great. However, Rossi, Llorente, Franco and Nihat comprise a very deep attack, leaving Jozy with only 4 appearances and 1 goal in the first half of the Liga BBVA (first division) season. Villareal loaned Jozy to Xerez of the second division. The team, however, was sitting at the top of the table and had no apparent need for the talented American forward. As a result, the prodigy of US soccer has been out of any sort of competition for the first quarter of 2009. A loan to a team like Levante, who are desperate for another attacking option with the loss of Alex Geijo. As was said on goal.com, this is a win-win situation for all parties. Jozy would get playing time, Villareal would see further development of the player, Xerez would unload unwanted baggage, and Levante would get a great attacking option. Myself, along with many other fans out there (especially the SBI mafia), are hoping this is true. This is the US's best new attacking option. Donovan and Ching are established but we need more prospects for the future. It's bad enough that Adu and Pearce aren't seeing much time on the pitch at all (especially Adu). Maybe Monaco should unload the talented Ghana-born youngster as well to a team in more need of a playmaker. I'm not sure if this move to Levante for Altidore is timely enough right now for the youngster to be called up for the world cup qualifiers starting in 10 days against El Salvador and Trinidad. A quick move right now plus playing time this weekend would definitely help. Just look at Giovanni dos Santos at Ipswich (loan from the Spurs). Puerto Rico Islanders: USL strikes again! 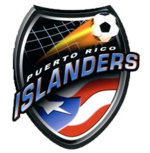 The Puerto Rico Islanders came through with a 2-0 victory. I admit I wasn't very positive on the possibilities that the lone non-Mexican team in the Concacaf Champions League would have. Not against mighty Cruz Azul. Mighty? Apparently not. Tonight, a hard-fought win by the USL team has put it that much closer to a spot in the Concachampions final and a spot in this year's Club World Cup. Granted, they still must face their Mexican counterparts in the return leg at Estadio Azul. I had heard some rumblings about the "cementeros" not living up to expectations and losing to lowly CD America--yes, to those of you unfamiliar with the Mexican league, the team is owned by a cement company--. Indeed, Galindo's team may not be a true test for a feisty USL squad that has surpassed all expectations. This brings me to another conclusion. How is it that two so-called second-tier teams are able to make it so far in a continental tournament? Well, you can thank the Concacaf chiefs for that. No other football confederation allows for a non-league team to advance into official continental competitions. UEFA Cup and Sudamericana certainly don't follow this scheme. But where would you get representatives from Canada aside from Toronto or the Caribbean aside from Jamaica and Trinidad and Tobago? Clearly something got lost in translation. Even America's own representatives, which were all MLS in the first installment of the tournament, can have a USL side. That's right, the winner of the US Open Cup can go through to the Concachampions. So let's say that Charleston beats DC in last year's Open Cup. That would mean that the US would get the Revs, Chivas and Houston along with Charleston. Ridiculous? Yes, sadly. This is the same as saying Barnsley goes through to the UEFA Champions League or Cup, or Municipal Canar goes through to the Libertadores or Sudamericana. I understand that there is a good deal of PR (pardon the pun) going on here. No one in Concacaf wants to be left out if they have legitimate teams. But then again, what does that say about the rest of the leagues in this conference? Is the Concacaf really that much worse than the AFC (Asia) or CAF (Africa)? Or, let's try another sport--Asheville tourists in the World Series. . . I'm all about being fair to everyone but there are lines that should be clearly defined. In the meantime, how about that USL?! 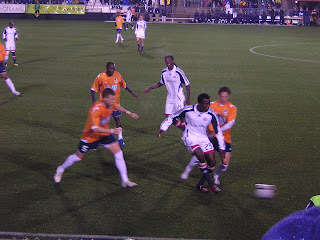 I love my Railhawks and I'm pulling for the Islanders all the way! Maybe it is true, USL isn't a lower division--it is an alternative league to MLS. 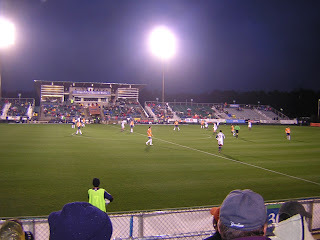 In what I hope to have as a semi-tradition, I attended a friendly pre-season match between my local USL club, the Carolina Railhawks, and an MLS team, New England Revolution. We braved 39 degree temperatures and a steady light rain. I was pleasantly surprised to see a good number of people braving the weather for this season's inaugural match (at least on our side of the stadium). 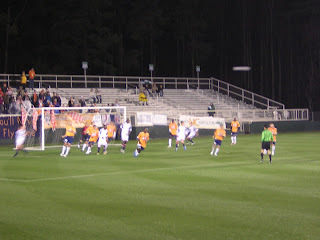 The Railhawks won 1-0. This time around, as I had alluded to in a previous post, the stakes were higher due to USL's place in American soccer as well as within the international scope of the region, the CONCACAF. I wanted to see just how well a USL side could play against a "top tier" MLS team. Last year's match between New York and the Railhawks was very one sided for the eventual MLS runner's up. However, lately the USL has represented the second-tier league in the Concacaf Champions League through Montreal Impact and Puerto Rico Islanders, and they have done so in style and successfully. Puerto Rico has gone through to the semi finals after beating Honduran team Marathon and Montreal Impact lost to Santos Laguna of Mexico after an amazing run that saw them win the first leg before 54,000 fans and a second game that they lost only in stoppage time. Mark Schulte scored the game-winner for the USL side during the first half, to the behest of a frustrated Jeff Larentowicz. I admit that I don't know many players on the Carolina side, but most of them got playing time (substitution rules are much less stringent in unofficial friendlies). The USL-1 team has former MLS players (Brian Plotkin, Columbus; Daniel Paladini, Chivas; John Gilkerson; New York) as well as some international players (Marcelo Romero, Spain; Sallieu Bundu, among others). I did recognize most of the New England squad, however. Jay Heaps, Nyassi, Mansally, Joseph, Igwe, Reis, Dube were there. The Gambians (Manssaly and Nyassi) impressed me, as did Alston (rookie). It may be true that sometimes games can be unpredictable in friendlies as well as cup games (F.A. Cup in England, Copa del Rey in Spain, US Open Cup in America). However, what seemed like a line of 3 at the back for the Railhawks yesterday, their style of play and treatment of the ball was quite noteworthy. As was the scoreline in their favor. Distances may be shorter between leagues but a special attention should be placed to further partnerships and interactions among the two leagues. As a side note, I propose an interesting relegation scheme for MLS... how about every season there are 3-4 teams from top USL side in the league, with two of them being relegated each season opening the way for another two USL teams. A total of 20 teams in the league can still be reached, as well as a wider audience that is increasingly favoring soccer as a top sport. 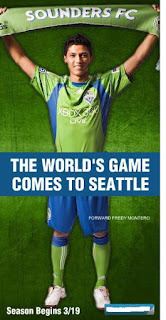 Case in point: 2009 MLS expansion team Seattle Sounders has already sold out their 20,000+ season tickets. 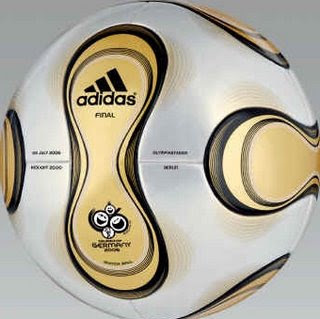 They debut on Thursday March 19th on ESPN2 against MLS Cup runners-up New York Red Bulls. After watching nearly all the Champions League games this week (at least pieces of games here and there) thanks in part to ESPN360.com--now free on college campuses--it once again became apparent how dominant the English Premier League truly is. Indeed, not Roma, Inter, Juventus or even mighty Real Madrid could get through the weakest of links--Arsenal, which currently sits outside of the Champions zone in the EPL table. Myself, along with ESPN's Tommy Smyth and others were wrong in our premature conclusion that "The Special One," a.k.a Jose Mourinho could get his Inter through the fortress that is Man U's Old Trafford. Vidic scored early and Cristiano Ronaldo finished the Serie A side with the second goal to end the match at 2-0. I also read that Mourinho apparently punched a fan after the game. Typical. So what makes the EPL so good? To start, infrastructure. Competition formats are clearly defined, as are each of the lower divisions, their ascending and descending rules, sponsorship and ownership. We're looking at several American owners in the league (Liverpool, Aston Villa, Derby County), Russian tycoons (Abromovich and Chelsea) and even superfunded Man City (Dubai group). Added to this is perhaps the greatest stock of coaches that have staying power (Ferguson, Wenger, Benitez) where in other leagues they are ousted within one or two seasons, i.e. Capello, Koeman. These coaches are given the benefit of the doubt even after coming in as fourth overall (Arsenal). Stability makes for good teams in my humble view... just look at some of the NFL teams. Then there are the players. More teams in the EPL are able to afford both the greatest and the largest quantity of soccer players on the planet. Cristiano Ronaldo, Robinho, Rooney, Fabreagas, Torres, Drogba, Ballack, and the list goes on. And the smaller teams like Wigan can afford some of the top players from minor countries as is the case with Valencia (Ecuador) and Figueroa (Honduras). Lastly and perhaps most importantly are the fans. They always show up. Be it for Championship games between Cardiff and Reading, F.A. and Carling Cup games with teams like Leeds and Coventry, and all matches in between. Perhaps it is the higher income in the island nation but you can't deny a British fan's devotion. 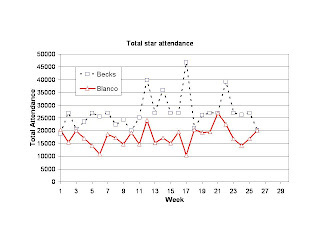 Case in point--Serie A games are often empty in the stands or only partially full even with Beckham at AC Milan. Such is also the case with Copa del Rey in Spain. Well, there is my opinion. Perhaps other leagues around Europe and the world should emulate the various aspects that make the English football game so special. It's true. MLS will never be the same because of Beckham. Now comes word that Becks will be splitting time between AC Milan and the LA Galaxy in a time-share type deal that includes a friendly between the two teams (that part I had predicted long ago). I think this isn't that bad a deal for either team(s) or player. Clearly, Beckham wants out of MLS so that he has a chance at being with England for 2010. Clearly this would not have been the case if his form had not faltered in 2007. Clearly, Steve McClaren's decision to part ways with the talented midfielder when he took the England manager position in 2006 meant a possible early retirement from international duty. And yet, through it all, it seems that MLS and the US actually revived the former England captain's career (this is something I read in ESPN magazine of all places). He regained a spot in the England squad after McClaren's results in Euro qualifying started to fall apart. Capello always had a soft spot for Becks (much like Eriksson) and he decided to keep "Golden Balls" around in what I must admit is increasingly looking like an overage England national team. 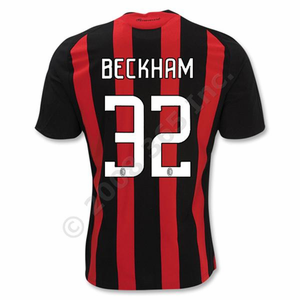 Beckham drew millions of fans, sold millions of jerseys (myself included), drew media attention to the league, opened the door for Blanco/Angel/Ljungberg/Lopez/Schellotto, and finally drew attention from another major team and league--AC Milan of Italy's Serie A. Beckham became only the fifth Englishman to win 100 caps when Capello recalled him to the England squad by Capello for the friendly against France on 26 March 2008. Women's soccer. Nowhere on the planet is the sport more synonymous with females in professional sports than in America. Okay, let's skip out on ice skating, WNBA and LPGA. If you think soccer in the US then you think 7-8-9 year-old girls that you probably coach without having any knowledge of the sports' tactics or intricacies. Who cares, right? It's just little girls playing. Then there's the amazing Mia Hamm, "Bend it like Beckham," and who can forget Brandy Chastain? Her take-my-top-off to celebrate the goal made the Sports Illustrated cover and many national newspapers here and abroad. Why can't girls show off too? And now comes their time. America's newest venture into female sports hopes to change a past tarnished by its previous incarnation, WUSA (Women's United Soccer Association), which failed horribly due to mismanagement, poor marketing, low attendance and a hyper-low budget (basic salary for low-level players was $7000 per year). Enter the Women's Professional Soccer (WPS) league. Revamped, renewed, refurnished, re-budgeted and reconstructed. I can only hope that this league sees it through the night that is an already overloaded American sports scene plus a bad economy. I have to admit that I wasn't initially in favor of this league seeing the MLS struggle as it has (even through the Beckham circus). I think the stakeholders know what's important for the game and for the women in the sport in general. As I read a piece on MajorLeagueSoccer Magazine I agreed with the fact that this country has the premier level in play from the ground up (that's your little girls in the local park). No one can deny the strength of our NCAA leagues or our high school girls' teams. WPS is now in the process of bringing in the considerable international-level stars that circle the globe. Incoming already is Brazilian Marta. An exquisite player with a keen eye for goal and who would give Mia Hamm certain competition. Players from other dominant leagues like Germany and Norway (also powerhouses in the female version of the sport) may find it hard to transfer to this side of the pond. The water's a bit cold still and WUSA's demise is fresh in many players' minds. Recent economic struggles domestically and abroad sure won't help things. But, as I always remark, there's plenty of room to dream. Teams included are: Boston, Chicago, Bay Area, DC, LA, NY, St. Louis. Atlanta, Philly and Dallas will be the expansion teams for 2010.